Welcome back to Portrait Prep! (If you missed the previous lessons, you can find them here: Intro, Lesson 1, Lesson 1.2). In this section, we're going to talk about the skull, the facial muscles, and the skin. These parts work together to form what we see as a complete face, so it’s important to get to know what’s going on under the surface to know how each part affects what we see. 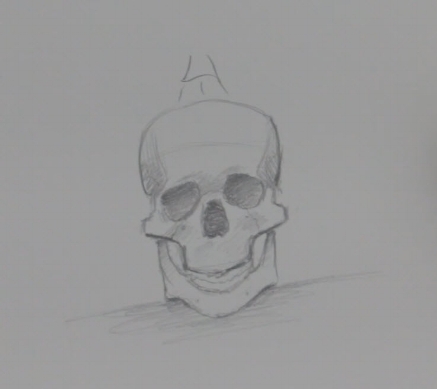 If you're using graphite and you're new to drawing the skull, remember to be patient with yourself and take it slow. Think more about the proportions of each of the areas you're drawing. I typically start any drawing in the top left corner, move downward through the drawing, and end at the bottom of my subject and over to the right. I'm right-handed and I don't want to impair my ability to see what I've already drawn or smudge anything, so this method is effective for me. To begin, draw a curve on the top right side to represent the major side plane of the skull in the cranium area. Next, make the same identical mark on the left side. Once you have those two marks down pretty accurately, connect them at the top by another curved line which will serve as the top of the head. Pay careful attention to the zygomatic area in the frontal view and make sure that you don't overemphasize it. You might be tempted to make it stick out further than it already does, so be careful! Another cautionary area when drawing the skull is making the orbitals too circular and too close together. You may also discover that you have a tendency to elongate the face area and make it seem much more vertical than it really is. But remember: this part of the course is intended to be a series of exercises. You’re not creating fine art renderings to be entered into a contest or gallery. This is simply sketching with a goal of improvement and training your eyes to recognize accuracy. Check out the reference that I've provided here as a guide for creating your skull drawing. You can also look at the quick sketch that I've done in the picture below. It doesn't need to be elaborate at this point. Just have a basic understanding of where these anatomical landmarks are. Portrait Prep Course students- please refer to the "Drawing the Skull" video that was emailed to you. Now that we have a bit more background about the skull, let's move on to the muscles of the face and head. If you're overly ambitious and have a lot of time on your hands, this would be an excellent time to learn all the muscles names that make up the face and head. If you’re like me and don’t have that much time to invest, don’t sweat it. All you really need is an understanding of where they are and how they relate to one another. There are a couple of areas that have some interesting formations in the face that you will want to notice, outlined in the pictures below. There are some rounded muscles in the eyes, for example. The mouth areas also have some curved types of muscles that affect the way the skin appears in the nose and in the forehead. And then there are some muscles that overlap each other and come together in separate places of the face: the corners of the mouth and some areas in the neck. Use the reference below to create a line drawing of the muscles of the head. This will help you gain a better grasp of where these muscles are and how they're positioned in the face. The last part of this section is a very brief look at the outer layer of the skin. That layer is affected by certain landmark areas in relationship to the skull and muscles underneath. Some of the most important areas to study skin positioning are the eyes, the mouth, and the nose. The eyeball itself is positioned higher up inside the eye socket. The eyelid actually closes over the upper part of the eye where the top lid will meet the lower lid and produce most of the movement. This is the reason why there are often shadows on the lower portion of the eyeball (the sclera). The mouth is more of a cylinder shape and is heavily influenced by the muscles that surround it immediately under the surface. The muscles get their overall contour from the skull (particularly the teeth, maxilla, and glabella). The nose has a curved area that covers the cartilage. While the length and side planes of the nose may not seem all that difficult to draw, the underlying structure and make-up of its anatomy is anything but simple. In conclusion, I hope that this lesson has helped you become more aware of the underlying anatomy of the head and face. When we start to draw a more serious rendering with colored pencil (or another medium of your choice), this knowledge should come back to you and inform your decisions. We want the knowledge to be sub-conscious and automatic so that we don’t have to think about it when we draw. We are working towards understanding WHAT we draw so that we can draw what we know. So we're trying to get past drawing what we see. Have a question or discussion point about this info? Sound off in the comments! Welcome to the final portion of Lesson 1! Last time we talked about drawing edges instead of lines and the importance of training our eye to see relative size and proportions. We also touched on value scales and spoke about how to look at a sphere. If you missed it or need a refresher, click here to review. This time we’ll begin by creating a few more shapes: first a triangle and a circle, then a cylinder to begin to see more depth. We’ll use what we learned about a value scale to shade these objects and turn them into three-dimensional objects that can represent something in real life. 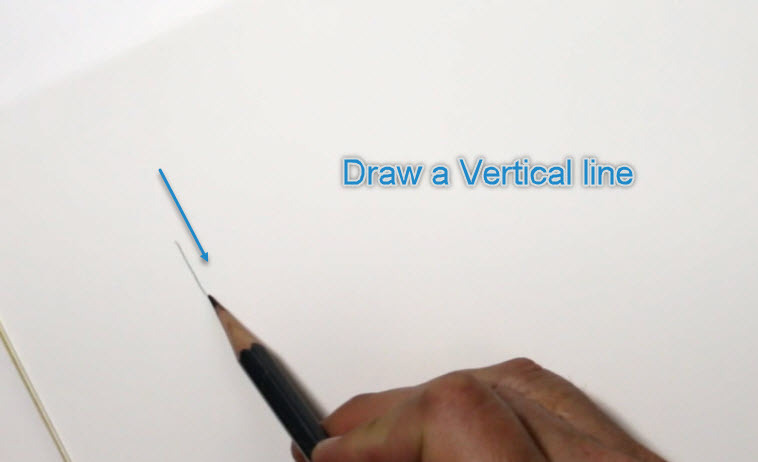 Draw your first vertical line…. ...and then your horizontal line. Be sure that your second line (which should be horizontal) is the same exact length as the vertical line. These equal lines should form a 90° angle. You should be able to identify where the diagonal line ought to go. You'll also start to notice the degree for the diagonal line. If your vertical and horizontal lines are 90° then your diagonal line should be around 45°. Create your own triangles and identify how the lines are related to one another! Note: How does this relate to portraiture? Good question! Consider the diagram below. I've drawn the lines for the mask of the face, the curvature of the head, and the outlines we would use to develop the entire head. See the triangle? What we're doing with this exercise is learning how to think about our subject matter in a very three-dimensional way. The line is from above the brow ridge to the ear hole (the external auditory meatus) next to the mastoid process. Now let’s move on to a circle. 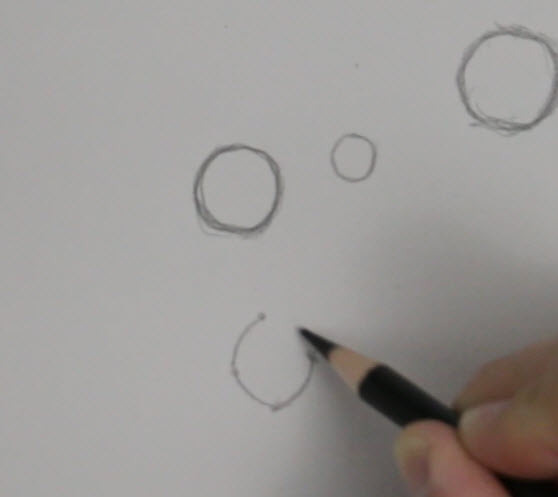 Drawing a circle is actually not quite as difficult as you may think. If you think about having four equal sides and then curve lines in between these points you should be able to draw a circle that is adequate enough to represent something that is circular in your portrait drawings. Look at my diagram below and see if you can draw your own circle using the same method. Create four dots evenly spaced apart, then add curved lines to complete the circle. Note: We will never escape the need to identify shapes in drawing portraits or anything that we draw. Seeing the shapes and being able to recognize the relationships between one edge and another edge, or from one object to another, is an integral part of being able to draw proportions correctly. Finally, let’s add more visual interest by creating a cylinder. Create an ellipse: Draw two target dots the width you want the cylinder to be, then draw a curved line between them. Then repeat in the opposite direction to create a mirror image of the first curve. Create the final curved line at the bottom. You should notice that it's parallel to the lower half of your ellipse at the top. You could shade in the cylinder at this point, but this is optional. The most important part of this exercise is to be able to see all of these lines in relationship to the whole object, and to create the curved lines to appear realistic and three dimensional. 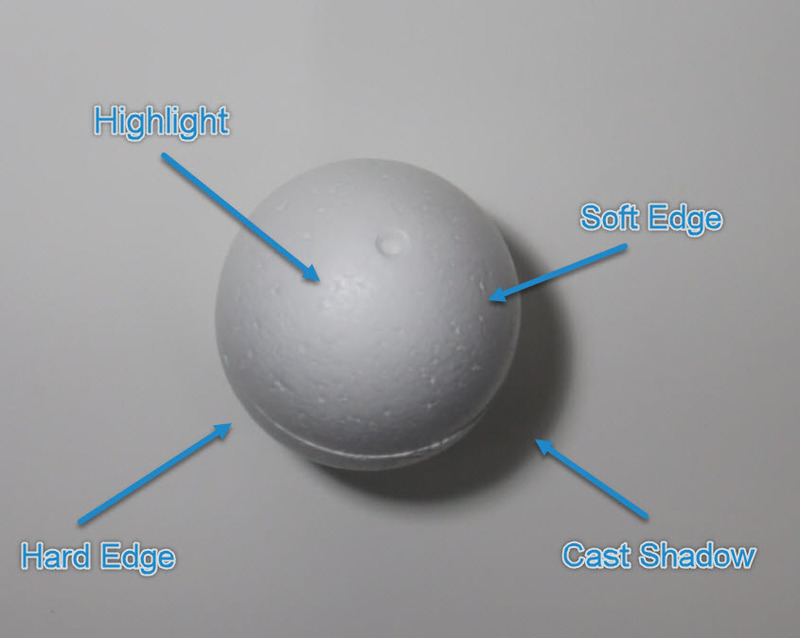 Remember the discussion of light and shading with the Styrofoam ball in the last part of Lesson 1? 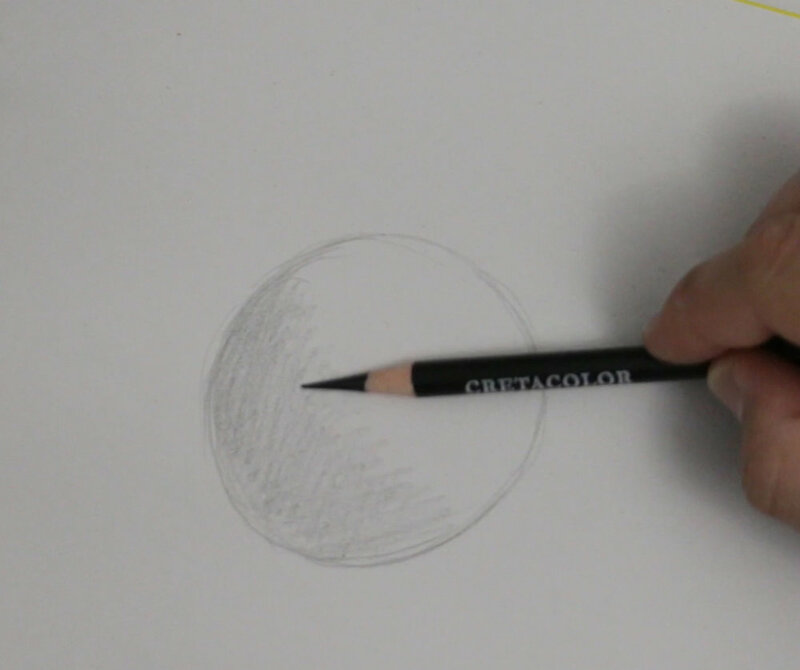 We’re going to use those same concepts when we talk about shading a circle into a sphere. Don’t forget: we'll have a hard edge, a soft edge, a cast shadow, and a highlight. Create an imperfect circle to fill in with value. Don't worry that the circle may not represent a flawless ball shape--you can refine the edges of the circle to make it appear more round as you go. Keep adding value very lightly so that you ensure everything is in balance. As you progress, refine the shape of the circle to be more complete. You CAN do this! Determine the light source and begin diagramming. Diagramming is simply a fancy term for labeling the elements of a drawing so you can think about the names of those elements in the drawing process. This is a fantastic way to learn the subtleties involved! Your mind will begin to identify these things as being different from the other elements in your drawing. The last elements to label are the values from the value scale that you created. This is a highly effective way to determine if you’ve created a full range of values with very soft transitions. You don’t want a hard edge where it doesn’t belong--like in the middle of the sphere! Simply draw lines and label 1 through 10. (I’ve grouped some of my numbers together to make it simpler, for example a 5 and 6 together and a 3 and 4 together.) The point is to create a sphere that makes sense--NOT to make the most beautiful-looking sphere anyone has ever seen! We’re getting so close to our skull lesson where much of this will all be coming together! Any questions about these exercises? Ask in the comment section! Welcome to the first official installment of the Portrait Prep Series! Today we’re going to talk about a few of the basic skills you’ll need before you ever start to tackle a face-- and I do mean basic! We’re taking it all the way back to lines, shading/value, and basic shapes. Grab a sketch pad and follow along! Lines can also convey body, fullness, or a dark color. Caricature artists do this all the time. Their dark lines indicate dark brown hair or black hair, and their light lines indicate blond hair. Believe it or not, a straight line isn’t found in nature! It’s just a convention that we’ve created to convey something that is visually ambiguous to us. Separating one value from another is a way for us to make sense of the world, but it’s important to note that straight lines will not be used in realistic drawing. Your work will end up looking more like a cartoon. Nevertheless, a line is what we use to create marks in drawing. I recommend using small, straight lines as your stroke rather than the ovals or circles or points or curves you may have seen. This stroke is far more versatile. Shading is really a study of shadow and light. If there is light, then shadows are certainly present. In its simplest form, a shadow is just the absence of light. When you begin to work on shading, you must ask yourself, “Is it a hard edge or is it a soft edge?” Next, think about what value on a scale of 1 to 10 that shadow is representing. The sphere clearly shows us the separations of light and shadows. Today we’ll be looking at the elements of a basic square without shading it in. In later lessons, we’ll work on shading all the shapes (circle, square and triangles) and making them more 3 dimensional. The most important concept here is learning to identify the length of your own mark by using your eyes. To do this, draw a vertical line. Then draw a perpendicular line (equal in size to your first line) to form the first half of your square. DON'T MEASURE. Check your work with a ruler. Were they actually the same size, or a little off? 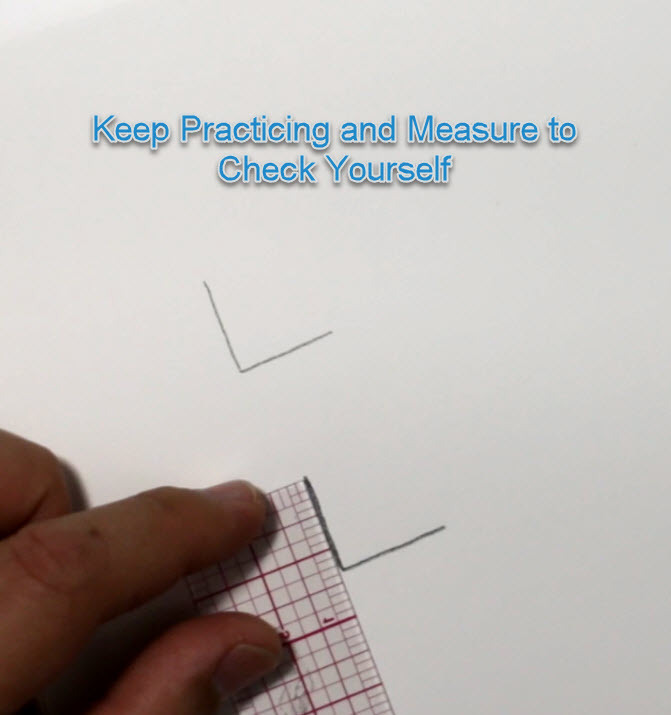 Keep practicing this exercise until you can draw lines of equal size every time. The next thing we’ll do is create a value scale. On a value scale from 1 to 10, the values will span from a light area (ranging from 1 to 6), then a darker, shadow area (ranging from 6 to 10). Practice fading the pencil from dark to light, then light to dark. Create a Value Scale 1 to 6, then a Value Scale 1 to 10. Practice over and over again. Draw a line vertically, then draw the line horizontally. Create a completely separate image that is the same shape, but is half the size. Repeat the process, this time starting with the smaller shape and moving to the larger shape. Congrats! You’ve made it through Lesson 1! We’ll be diving into contoured lines and more basic shapes next time. Tell us about your progress in the comments! Stop Beginning At The End! Portraits are some of the most striking pieces in colored pencil. When done properly, the realism is breathtaking! Many artists (myself included) see colored pencil portraits and feel inspired to try to draw one themselves. They race off to the bookstore or start searching YouTube for a great tutorial, then wonder why their portraits fall short. Why don’t my colored pencil portraits look realistic? Where did I go wrong? Can I learn how to do this? What am I missing? That last question is the most important! 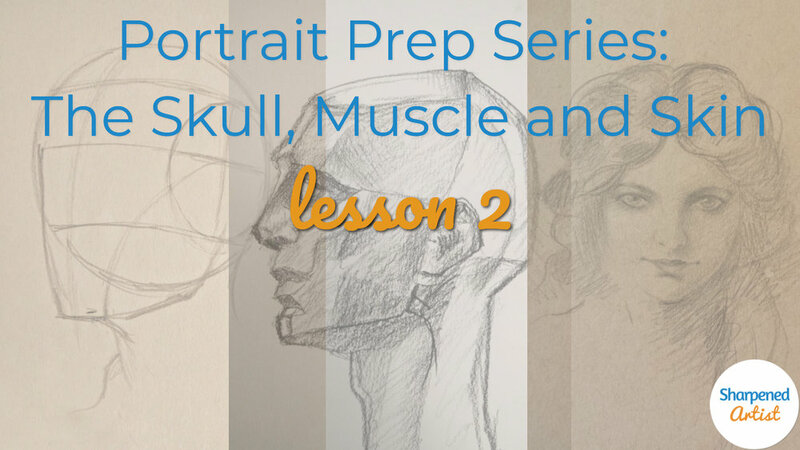 Most portrait tutorials are missing some of the most fundamental information needed to draw a truly realistic portrait: anatomy of the skull and face, angle and positioning variations, ideal proportions, and more. It took me an embarrassingly long time to figure this out for myself. But once I headed back to the beginning and did some of the necessary pre-work, I became comfortable with portraiture and love the results. My portraits started to come alive the way I had always wanted plus I was way more confident throughout my drawing process. Welcome to the Portrait Prep Drawing Series! In this series of lessons, I want to lead you through the all-important fundamental information. If you’re anything like me, you might think you can skip all of this stuff. How to draw a line?? Anatomy? Head construction? Sounds like a waste of time-- I’ll just study photography and find great reference photos instead. Not so fast, my friend! Learn from my mistakes, and begin at the beginning. To create an appealing house, it’s essential to first build the frame before putting up the walls, painting, and decorating, right? Portraits are no different. To create a realistic portrait, you have to understand the underlying structure of the head before rendering the skin and hair and other features. Follow along through the next few posts as I share with you some of the information I wish I’d had when I started drawing portraits. By the time we’re through, I want you to be so familiar with every possibility (face positioning, angles, and foreshortening of the features) that when you finally pick up your colored pencil, you will be ready to paint that final layer on a well-constructed head. Bookmark this page and check back next week for the first installment of the Portrait Prep Drawing Series! Want an even deeper look at drawing portraits? Sign up for my FREE Portrait Prep Drawing Course! Portrait Prep is a video course delivered straight to your inbox each week. 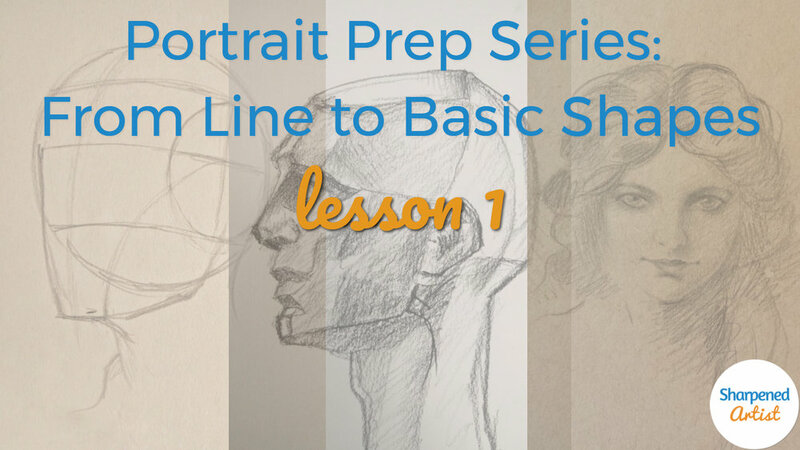 Together we’ll walk through the core fundamentals of drawing incredible portraits. What are your biggest challenges when drawing colored pencil portraits? Share in the comments below! Is Talent Holding You Back? Have you ever been told you have a “natural talent” for art? I get it-- I’ve been told that, too. You’ve probably thought it was a benefit….but natural talent can also be one of the largest obstacles to improvement. The “talent myth” can make you feel like you can sit back and not worry about improving, thinking you will just naturally get better. You might think, I’ve never really learned what I’m doing now and it seems to be working. So you reject learning anything new that may offer some artistic insight. Some artists are even afraid of demystifying the process. They’re worried that they may not be able to intuitively engage in their craft anymore--and that’s definitely a scary thought! Sometimes you have to “unlearn” before you can improve! Believe it or not, there is a methodical approach to what you’re doing when you draw or paint. If you’re open to discovering it, it can help you blow past your current limitations. Talent can only get you so far. Develop more control of your craft when you know how it all works. Know how to make any necessary corrections. Learn how to approach a drawing in the same way every time. Know why you tackle the hair first (or last) on a portrait. Learn to focus on shadows first and increase their value slowly as you build up the drawing. …..and that’s just the beginning! You can learn the building blocks that will take it to the next level-- and the first way to begin this process is to not let talent hold you back. You want to level up your art--and that means you and I are a lot alike! Tune in next time where I’ll keep sharing what I’ve learned on my journey. ​​​​​​​Are You Drawing Backgrounds That Don’t Work? Let’s have a little chat about backgrounds, shall we? Most new artists feel the need to have a background in their drawing. That’s all well and good. Add depth and interest to your subject. Create context and keep the viewer engaged longer. Help establish the focal point and allow the subject to stand out. Let me use a few photographs to explain what I mean. 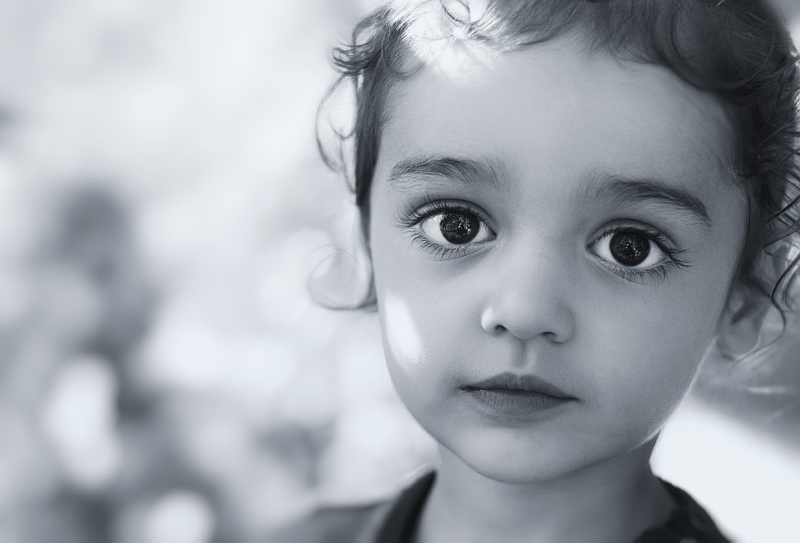 When you look at this photo of a little girl, your gaze is automatically to her eyes-- that’s the focal point. The dark irises are starkly contrasted to the white of the eyes (sclera). What do you notice about the background? It’s just a few blurry shadows and barely there at all. In fact, you probably didn’t notice it until I asked about it. That’s the sign of a background done right. Can you imagine what would happen to the impact of this photo if it had one of those “use all the circles” backgrounds I’ve been seeing lately? Now instead of a realistic portrait, we have some sort of new-age space photo. The circles are incredibly distracting and the eyes no longer have our full attention. Why? Because the background has just as much contrast as the eyes do. The entire tone of the portrait has been altered--and not for the better. Notice that the level of detail in the background is similar to the level of detail in the subject. The colors are similar across the board, too. We see similar values in the skin, hair, and face of the subject as we do in the background of the rock, stairs, and leaves. The reason this doesn't work is because our eyes are naturally going to focus where there is more contrast. The brightest, or lightest value, of this picture is the dress. So our eyes are immediately drawn there. It does nothing for the overall balance and composition and the focal point is uncertain. A simpler background with less contrast would have created more focus on the portrait itself. I've done this in the edit below. The background in this shot is WAY too distracting. Now that you’ve seen how this works in photography, you can apply the same concepts to your art. If you can include a background that makes sense for your piece--one that is NOT distracting-- then go for it! Otherwise, just leave it out. Let the subject be the focal point no matter what! ***NOTE: All photos in this post are free to use commercially or personally without attribution. When I first started drawing, I was like most beginner artists and used only graphite and charcoal. When I discovered colored pencils, it felt like everything clicked. Suddenly, my drawings had the potential for greater versatility and depth. I'd hit the jackpot! All those feelings of excitement quickly drained away the first time I tried (and failed) to erase the way I had been used to. Was it possible that colored pencil wasn't the versatile medium I had hoped it would be? Was my art career over before it even started? Would I be better off giving up entirely? Obviously, I needed a little pep talk and some research. In time, I learned several erasing methods that give me more freedom and options. Thank goodness I didn't call it quits, because you CAN erase colored pencil--and it isn't even difficult! Using a light hand (also called light pressure) when applying the pencil is the first method I recommend. To do this, hold the pencil comfortably in the tripod position. Keep your grip loose enough for the pencil to graze the surface of the paper using its own weight alone. Holding the pencil further down the shaft (opposite the point) will help you do this. If you use a soft touch and you’re careful not to burnish your paper too early, then you can erase marks if you need to. Keeping a light hand not only helps with getting tons of layers down but it also helps you to erase the pigment if you need to. If you press very hard and grind the pigment down into the paper, it simply cannot be removed. Are you a burnisher? No problem. Go ahead and burnish, but wait to do it until the very end when there is nothing more to do on the drawing. Build up the layer 1 to 2 colors at a time all over the areas in your drawing. Only after you’ve done one layer of color everywhere will you move to the next color. Repeat the process of building up the next layer slowly and gradually, and keep the point of your pencil sharp the entire time. Keep a test sheet of paper next to your drawing and take notes on order in which you laid down the pencil colors. When you remove or erase areas of pigment in a certain area, you'll need to build the pigment back up in that small area using the same process as the section surrounding it. Without detailed notes about the colors you used and the order you layered them, you may find yourself constantly building up color in a fruitless effort to remember how you achieved your original look. Like a boxer in the ring using 3 types of blows against his opponent, you also have to go at this removal process in these 3 creative ways. First, tap with a kneaded eraser or poster tack. If you’ve followed the first 2 methods then your pigment will be easy to erase! 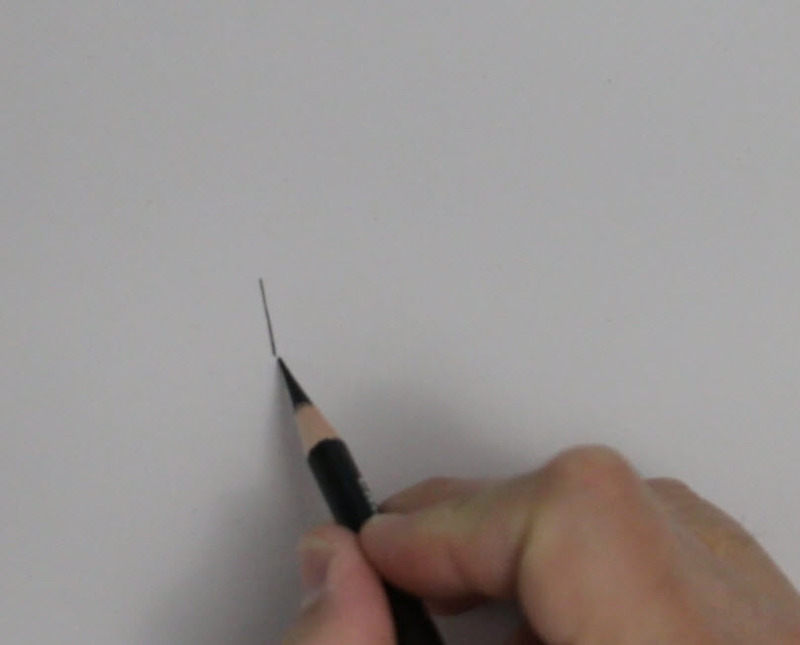 The idea of tapping is to gently touch the paper with the sticky adhesive of the kneaded eraser and allow the pigment to be lifted from the surface. It seems to be more effective if you do this gently and keep moving your eraser to a clean area. Keep in mind, there is a law of diminishing returns with this method. If you’ve done it a number of times and you notice that there isn’t anymore pigment coming off, then it is time to move on to part 2 of this erasing method. In the lift approach, you can take Scotch tape and apply a small bit to the area. Press it down gently with the tip of the pencil and then lift up on the tape and you’ll see more pigment magically disappearing. It's known as 'magic tape' for a reason! Here’s a portrait I was working on recently where I used this very method to correct problems I had with the black pigment in the eyelashes. I followed these simple steps and I was back on track in no time. If these first two methods don't work, go ahead and try the third choice as a last resort. This option involves using a synthetic eraser or plastic eraser to remove any last pieces of the pigment that have become a stubborn stain on the paper. There are also effective battery-operated erasers that make this process even faster and offer a lot of control. So there you have it-- three ways to use whatever drawing techniques you like while enjoying the freedom to erase. What more could an artist ask for? I'm a big fan of the Internet. One of my favorite parts of running an online business is the opportunity to get to know people from all walks of life. I'm always intrigued by the variety of people who find Sharpened Artist. I come from a large family. My parents had 10 children, and I was #8. When I was 7 years old I was rushed to the ER after having my right hand caught in an air compressor. The doctor did a skin graft from my stomach to patch up part of my 3rd finger. You may see that scar from time to time in my videos. Now I can scratch my belly by just scratching my finger in that one spot. Ha! I grew up way out in the country of rural southwest Oklahoma. My brothers and I hunted and fished a lot. When I was about 12 years old I took a correspondence course to learn taxidermy. I mounted birds and small animals. Believe it or not, it was an artistic outlet. I'm a christian. I believe things that are not always politically correct. I think there is virtue and value in maintaining things that have stood the test of time and are logical and orderly. I don't think something has value just because it's faster, larger, or more recent. I live in a suburb of Cincinnati, Ohio and my art studio and classroom are in the historical town of Milford only a short drive from my home. I worked in a systems/IT role for about 20 years at the same company. My commute to work was 40-60 minutes in the morning and around an hour and a half in the afternoon. Back then I listened to lots of podcasts to pass the time. My grandmother Henri inspired me to be an artist. She always told me that I was going to be an artist when I grew up, and I believed her. I drew all the time as a child. I often got in trouble at school for drawing during class. I have always been a music lover. I love to sing and I used to play guitar a little when I had more time for extra hobbies. I’m very much at home in the kitchen. I love cooking, baking, using knives, and making things from scratch. I have a cat in my home named Mascara. Yes, my daughters named her that. I love that cat! My favorite hue is blue. I prefer the cooler blues, but any shade of that gorgeous hue is great! One of my favorite simple pleasures in life is coffee! I don’t care where I get it- Starbucks, the boutique coffee shop down the street, or my Keurig at home. All I need is a cup of joe, a laptop (if I’m working on my websites), or a Stonehenge drawing pad and a few pencils and I’m transported to a happy place. If you have a specific question about me, feel free to post it in the comments below! 1. Do your research. Every competition is different, so the first step is to be familiar with the one you are entering. Due date, file specifications, and entry fee are all things to be aware of, but it can also be beneficial to do a little sleuthing about the judges. If you're into realism but these judges tend to prefer abstract pieces, for example, you may be better off entering elsewhere. 2. Consider your investment. Most art shows and competitions require you to pay an entry fee, which is typically used to pay for the building, insurance for the event, and that fabulous cash prize you are hoping to earn. It's important to decide ahead of time how much you can afford to spend on an entry fee. If art is not your full time job (raising my own hand here!) then you might not have a whole lot of extra cash sitting around to spend on entry fees. And if you still consider yourself a beginner, it may be a better use of those limited dollars to invest in some higher quality supplies. 3. Have realistic expectations. 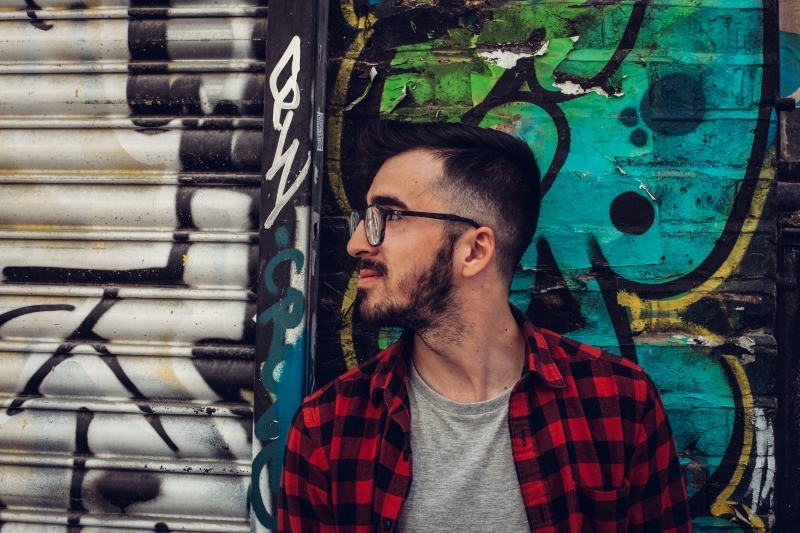 Most artists don't find competitions to be an instant jump forward in their careers, but they can be a great way to network, bolster your resume, and generally get your name out there. And most importantly, be sure that you are in it for the joy of the experience! So there you have it--3 considerations for entering art competitions. What would you add to the list? Accepting commissions may seem like a no-brainer. Getting paid to do what you love? Yes please! It's a wonderful way to build your portfolio and promote your business. But accepting a commission before you're ready can end up being detrimental. Here are the steps you should take BEFORE accepting a commission. 1. Have 10-15 pieces of that type (pet portrait, landscape, etc) under your belt. This will allow you to know your own timeline for completion, and patrons will be able to predict what a new piece will look like since you are already establishing your style. 2. Firmly set your pricing structure and make it available to potential clients. You may publish it on your website or have a document ready to send in response to an inquiry. Either way, stick to your guns on pricing! You don't want to gain the reputation of being someone who can be haggled with. 3. Decide how much you will require as a deposit--and yes, you need to take a deposit! This will deter clients who aren't serious about paying for the final product. 4. Agree on a detailed reference photo BEFORE signing a contract so that you have something you can work from. People look at your best work and expect that their commission will look the same. This won't happen if the reference photo is sub par. Until you have a clear photo in your hand, do not accept the work. 5. Develop a contract for services rendered. Be very clear about the scope of the work that you have agreed to do, and the financial responsibility of the patron. 6. Find out the patron's preference for social media sharing of their piece, both in-progress and at completion. If the piece is a gift, they may want you to wait. There also may be privacy concerns if the subject is a minor. Before accepting the commission, this is a conversation you need to have. 7. Have marketing materials ready to send with the finished piece. You'll want to have these ready before you start so you won't be scrambling to throw something together when you've completed the work. Consider a high-quality business card at the very least. 8. Don't be afraid to turn down a commission if something feels off. If you are not going to be a great fit for this patron, there are plenty of other artists out there who may. Don't feel obligated to accept just because someone asks. Value your own time and skill, and feel free to be selective. By taking these steps before you ever accept a commission, you'll be ready to respond at the first request and communicate how professional you truly are! What are your tips for successful commissions? Is There A Right Way To Draw? I can answer this question quite emphatically: No, there is not a “right” way to draw. But I think there are some more effective ways to draw and I think there are some less effective ways to draw. What do I mean by that? Allow me to explain. If you think about the mechanics of drawing then you’re probably visualizing a writing instrument, a paper and maybe a reference or at least an idea that is being executed, right? Yep! Those are the base requirements to get started. But drawing is so much more than this. I hear artists, especially young artists, talk about how they like to just draw from their memory. If you’re attempting to just get a quick sketch (concept) on paper then that’s a good way to do it. But if, on the other hand, you want to develop a drawing that is dynamic and full of life, then I suggest putting more planning and thought into it. Drawing from memory is not wrong, but it could be described as less effective. What are you wanting to convey? Try to be as detailed in your response as possible. Do you have a reference for your drawing? If so, is it detailed enough for you to see what you need to see? What tools in particular are you going to use? What about pencils, paper, size of paper and placement of the subject on the paper? Are you going to allow a lot of negative space around your drawing or are you filling the paper entirely? Are you going to draw a background or not? Once that preliminary planning is done, there is a second part to getting started. At this point you could dive in and probably be fine. But ask yourself, is there anything about this process that involves something brand new? Maybe you’re using different pencils or paper that you’ve not drawn on before. If that’s the case then you will want to test on a separate page to determine what will happen so you can eliminate any surprises. Now you are making your first marks on the page. You want to start with a light hand so that you can erase anything that you may want to alter later. This is the reason I always start with a dark pencil or at least a middle tone color so that I can see what I’m drawing and so that it can provide a skeletal framework for me to work inside of. As I progress in the drawing process I am constantly refining my line drawing and I am erasing the line drawing where I may have made incorrect marks. Specifically, I’m looking for incorrect proportions in a face, I’m looking for a form shadow that is too overbearing, and I’m looking for something in my drawing that is starting to draw too much attention. When you’re just beginning you probably do not want to draw more than 15 or 20 minutes without taking a break. Why? Because you will grow mentally tired and may make a decision that is not in balance with the entire drawing and you may inadvertently create an eye-sore that you will have trouble removing later. But after a 5 or 10 minute break your perspective will be fresh and your vision will be clearer. Remember that drawing is more about seeing than it is drawing. If you draw with a heavy hand at the beginning and you develop one area (like a neck for example in a portrait) and you’ve left the forehead alone, then you will need to remember exactly how you executed the neck. It is so much easier to go ahead and do the layers all at the same time. If you lay a base layer of “brown ochre” down in one area of your drawing, then just make sure you layer that color everywhere (of course the coverage will vary according to subject). Once that is done, then move on to the next layer. The stroke that you use should be something where you are holding the pencil with a comfortable grip and with a motion that you can sustain for a long time without tiring. You can also use a variety of strokes, but they should always be controlled and not strained. The pencil should be able to rest comfortably in your hand to allow you to make the mark you intend to make. You never want a situation where you are wondering where the tip of the pencil is going to end up connecting with the paper. Finally, once you make a mark please never think that you have to live with that mark. If you don’t like the mark you just made then erase it and do it again. You will get better at making marks and it will get easier to control. But don’t make the mistake of waiting until an hour goes by, thinking in your mind, I’ll just correct those mistakes later. Do it now. Take care of it while you remember what you need to correct. Is this the only way to approach a drawing? Absolutely not. But this is what I have found to be more effective time and time again. Ready to get started using colored pencil? Download my getting started guide! As an artist, I often get questions from people about their own drawings. One of the things I hear over and over again is, “How do I get my drawings to look more realistic?” This question is usually followed by an exasperated sigh, as if the budding artist is close to giving up. This is a current commission I'm working on and you can see that the face is all rendered in monochromatic, only one pencil color. I'm using Bark, Inktense, from Derwent. Conventional wisdom would tell you not to create a line for something that should be represented as a curve or an edge, opting to use shading to represent everything instead (even where you think there is a line). This is very good instruction for achieving more realistic drawings, as it will call your attention to shape, size, proportion, and relationships to negative space. These are all good things to be aware of. But I think the most realistic drawings come when an artist develops the ability to see value changes and differences in the middle values. The average joe can usually tell the difference between the darkest values and the brightest values, but to go beyond that and start to make judgments in the middle values will bring your drawing to a whole new level. I know what you’re thinking—Sure, John, sounds great. But how in the world do I learn how to look at middle values? I’m so glad you asked! One way to do this is to begin using a technique from the old masters called the grisaille (pronounced GRIZ-EYE) method. (This has nothing to do with a grizzly bear, or its eye… though that would make an interesting drawing.) In the grisaille method, you render your entire drawing by reducing down to values. For example, if I am drawing a colored pencil portrait then I will first draw the entire drawing using 1 or 2 pencils colors. I will only use light pressure in the lightest areas. I will cover the entire face with the pencil and will not go on to until I cover the entire face. Outline. Create a very soft (nearly invisible) outline of the proportions. The outline of the face, the edge of the hair line, the outline of the eyes, then nose and mouth. Go Dark. Next, gently increase the value of all the areas where you see shadows. For example the corners of the mouth, the corners of the eye, the underside edge of the nose. Make the Middle. Finally, with a very dark pencil and with the lightest touch you can possible make increase the value in areas that you consider the middle values. Here is where the magic will begin to happen. By “lightest touch possible” I mean that the only pressure you exert in nearly just the weight of the pencil itself and you are only controlling the direction of the tip! EXTREMELY light touch. Imagine that the paper is a pressurized bomb and if you press too hard it will blow up in your face. Ok, that was extreme. You get my point, right? "What Is Your Favorite Paper?" It's a question I get often. A colored pencil artist has many options when it comes to paper! One of the things I like about using colored pencils is you can use so many different types of papers or supports. Anything from canvas, paper, glass, wood or stone or even some I haven’t thought of! I have used and tested several different papers and have settled on a few. But there is one that I tend to use more than any other. That paper is Stonehenge from Legion paper. Tooth: The tooth of the paper refers to the texture on the surface of the paper, sometimes called hills and valleys. The tooth of this paper has a random texture and is still smooth enough to get good detail without having to fill in a lot of layers to do it. But, if you want more layers it can take a lot of layers! This paper is made of 100% cotton and is acid free. This means it will stand up to a lot of reworking and solvents and still maintain its original shape and not buckle as long as it it’s taped down flat. It will also last many years and is archival because there is no acid in the paper making production. So far the company has stood behind its product and has consistently produced a good product. It is always consistent in quality and you can rely on the paper from a new purchase is going to be just like the last time you bought it. The thickness of the paper is 90 lbs. It is just about the right thickness. It is not so thick that you can’t print on it. It’s also not too thin that it seems flimsy. What is YOUR favorite paper? I'd love to hear what you like! leave me a comment.